The Dividist Papers: On the inevitability of divided government and the emergence of parliament envy. On the inevitability of divided government and the emergence of parliament envy. Political pundits, columnists, bloggers and others of that ilk are coming to terms with the realization we will have divided federal government for the foreseeable future. The Dividist is, of course, delighted by this prospect. We find divided government to be the last best hope for limiting bad legislation, containing explosive growth in federal government spending, protecting civil liberties, and moving incrementally toward other preferred policy objectives. Or, at least, moving away from them at a slower pace than under unified one party rule. But not everyone is so sanguine about this state of affairs. Many Republicans have yet to work through the stages of grief over the 2012 election outcome. They are still in denial and angry over failing to take the White House and Senate and restoring the glory days of One Party Republican Rule from '03 - '06. During the government shutdown last fall, Democrats bought into the delusion that they could sweep the discredited Republicans from the House in the 2014 midterms and restore the era of One Party Democratic Rule, much as they enjoyed during the first two years of President Obama's administration. They are only now coming to terms with the realization that, not only is the House majority a virtual lock for Republicans, but there is a very real probability that Democrats will also lose majority control of the Senate. The range of reactions to the inevitability of continuing divided government are instructive and, dare I say - offers a teachable moment. "... we do seem to be entering an era in which Democrats have an ever stronger edge in presidential elections and Republicans have an ever stronger edge in congressional elections, especially midterms. 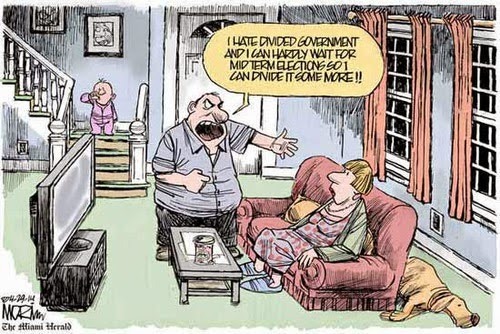 Unless something changes, we can probably look forward to divided government for a long time." "As a liberal, I'm inclined toward national political solutions rather than state-level decisions. But the chasm-like bifurcation that has caused divided government in Washington at the same time it is unifying state governments suggests that maybe we have reached a moment in American politics where — except for decisions about core rights like access to ballots or the wedding altar that must be decided nationally — it makes sense to shift more power back to the states, thereby allowing voters to more closely tailor policies to their partisan liking." Wait. Shifting more power to the states? Yet another beneficial policy outcome of federal divided government that the Dividist had not even considered. Well played professor. Rob Wile of Business Insider is looking ahead to the 2016 election and quotes Potomac Research Group's Greg Valliere explanation of why President Hillary Clinton would be great for stocks. "The last time we had a pragmatic, pro-Wall Street Democrat in the White House -- checkmated by a Republican Congress -- equities surged by 150% over eight years, GDP growth averaged 3.8% and unemployment fell to 4.2%. We refer, of course, to the Bill Clinton presidency." "THE KEY -- DIVIDED GOVERNMENT: The stock market surged after Clinton's first two years, when the Republicans captured both houses of Congress in the 1994 election. 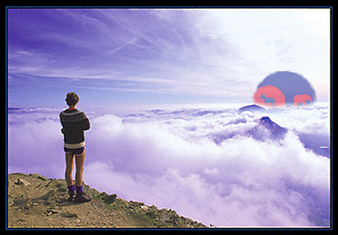 The Newt Gingrich revolution was largely hype, but the GOP thwarted Bill Clinton -- as it would Hillary Clinton." The Dividist has blogged for years about this supposed connection between presidential party affiliation / divided / united government and stock market performance. We tend to be pretty dubious about the entire premise, putting it in the same "correlation isn't causation" category as the Hemline Index or the Super Bowl Indicator. But if the investor class believe that divided government produces strong stock market performance it can be a self-fulfilling prophecy in the short term. We're good with it. "What we have seen in Washington, D.C. for a while now is divided government... So how can we fix the problem? If ideologically based politics is here to stay, then what we need is a Parliamentary style, English system of federal elections. When you vote, the winning party is ushered in, and they have the opportunity to have their way with what they want to do for their term in office." This is not the first time the Dividist has heard this wistful longing for something other than constrained powers split among separate and equal branches as codified in our Constitution. Fareed Zakaria of CNN made a similar argument in 2011 on the occasion of the debt limit debate and our S&P downgrade. This argument is usually promoted by true believers in the all seeing, all wise, all powerful, hugely expanded beneficent federal government bestowing favors on the land. You know who you are. A Prime Minister / Parliamentary system is a profoundly bad idea for the United States. However, since there is exactly zero possibility of anything like European style parliaments being implemented here, the Dividist cannot get too exercised over the proposition. We think our time is more productively spent worrying about a more probable catastrophe - say, for example - the Sweet Meteor of Death hitting earth and ending all life on planet as we know it. That said, this is an opportunity to repeat and reinforce once again the historical case for divided government. Our constitutional government was designed from the ground up to be a divided government as explained clearly by constitutional architect James Madison in Federalist #51. 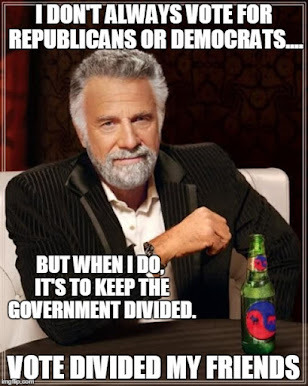 Our system of government is designed to be divided. If partisan unity overrides the checks and balances built into the Constitution, then our government is not working as designed. A parliamentary government, by contrast, is designed to elect a unified government for as long as the electorate considers said government to be representative of the majority - whether a single party or a coalition. One could argue that a divided government is contrary to the spirit and design of a parliamentary system, while a unified government is contrary to the spirit and design of the U.S. Constitution. "What a perfect phrase to describe our Constitution and our national zeitgeist - "the enshrinement of argument". In this political season, with the mind numbing and meaningless appeals to "unity" amid the disparagement of partisanship, polarization, and debate, it is useful to recall that this country was built (and the constitution designed) on the expectation and promotion of continuous conflict and argument. For the founders, "unity" and "government power" was a dangerous mix to be feared and avoided. It smacked of monarchy. Checks, balances, divided government and pitting "ambition against ambition" was exactly the state they sought to enshrine." And that is exactly the state we have. It's working as designed. The American electorate gave democrats majority control in the House in 2006 because they did not want President Bush and Republicans to have a free hand to implement their policies. Republican ambitions were thwarted. The American electorate gave Republicans majority control in the House in 2010 because Americans do not want President Obama and Democrats to have a free hand to implement their policies. Democratic ambitions were thwarted.